The Way You Share Your Contact Information, Reinvented! Recently, I attended a global networking event. Those in attendance were C-level executives from Fortune 500 and 1000 companies. It was only fitting that everyone was exchanging business cards in rapid-fire. While networking and mingling, I came across a number of individuals who either ran out of business cards or simply forgot to bring them. This made me ask myself a question; what is the real value of a business card? What if companies did away with paper business cards? Would employees still be able to network with potential customers and colleagues? 88% of business cards handed out will be thrown out in less than a week. Business cards are synonymous with networking and are widely used by professionals, businesses, and entrepreneurs worldwide. However, when you take into account the primary purpose of a business card, a tangible object serving as a way for people and colleagues to remember you after a first meeting, you can make the argument that the value is not the card itself. It is the contact information associated with the card that holds the true value. Networking and sharing your contact information is just one piece of the puzzle. What about the other pieces such as highlighting your product or service, following up, or adding comments about the conversation? Research shows, on average, companies spend $50 USD per 500 business cards per employee each year. Additionally, 88% of business cards handed out will be thrown out in less than a week. Sure, the net cost is sustainable to a certain degree but if your company supplies business cards to 100+ employees annually, that 88% of business cards sitting at the bottom of someone’s trash bin can impact your bottom line. Not to mention, the pain and hassle of having to reprint business cards when your contact information changes or onboarding new employees. The way we share our contact information needs to be reinvented. From our perspective, the context of a conversation, as it relates to the social interaction, should dictate the level of information shared between two or more people. For example, the contact information you would share with someone you met at the grocery store more than likely would not be the same information you would share with a person you met at a conference. In this digital age, the way we share our contact information with others must be reinvented, smarter and more intuitive. The Switchit mobile app provides all the pieces to the puzzle so you can focus on creating meaningful connections while networking. 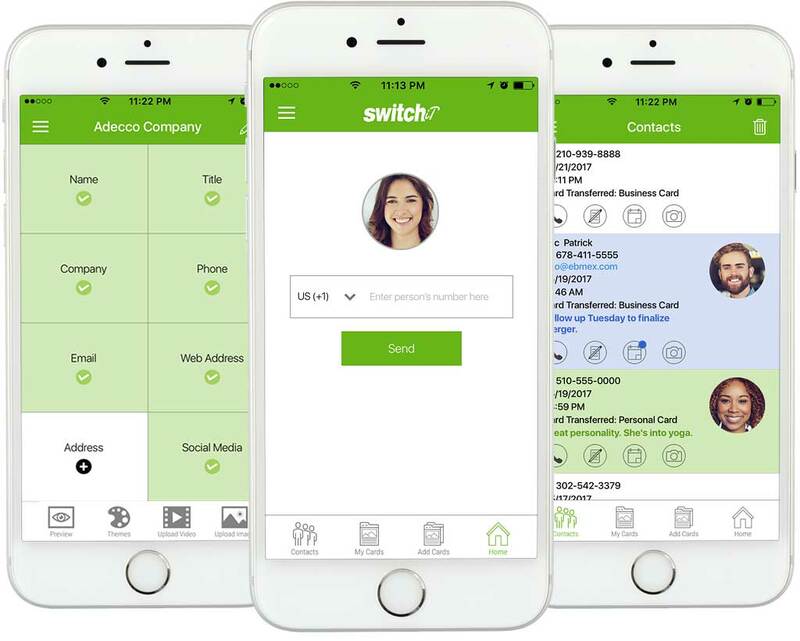 Switchit allows you to instantly share all your contact information and social media networks, while automatically saving the person’s name, phone number, email address and photo inside the app. Do you want to highlight your products or services? Upload a promotional video to your digital business card. Quickly follow up with potential leads by syncing your Microsoft Outlook or Google Calendar account. Our mission is to make the process of networking, promoting your business, and managing your contacts seamless. Over the coming months, you will see new features and integrations, including many features designed for teams and businesses. We will also continue to make improvements to our user experience. We’d love to hear what you think. Please email us at team@switchitapp.com with any suggestions. Feel free to go give Switchit a try! Thanks for reading! I made my digital business card with the help of the Switchit app. Its very cool app and exactly what I was looking for. This app gets my job done.